I’ve written a few times about Burgermeester, the self-proclaimed master of burgers in Amsterdam. Their formula of high-quality burgers in a no frills setting has just been copied quite successfully by the Burger Bar. 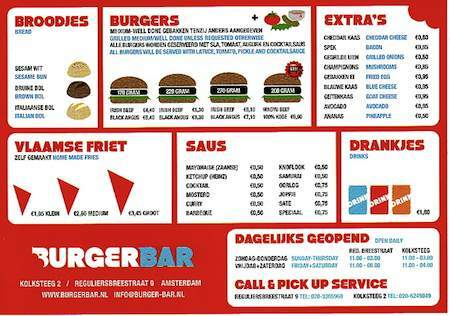 The Burger Bar has two shops in Amsterdam, one near the Dam and one just off Rembrandtplein. Both Burgermeester and the Burger Bar focus on quality meat, fresh ingredients and burgers made fresh on the spot. Where Burgermeester excels at a menu of inventive burgers, the Burger Bar lets you pick and choose your own burger. You can pick from three types of bread, a number of extras such as cheese, onions or mushrooms, as well as twelve sauces. Trying to fully cater to everybody’s preferences, you can even choose the type of meat! There’s the standard Irish beef, the superb black Angus and a 100% Kobe Wagyu option. It’s rare to see quality food and take-away in the touristy areas around the Dam and Rembrantplein and the Burger Bar is a great option when you’re around there looking for a quick lunch or snack. I thoroughly enjoyed my black Angus burger with cheese and mushrooms on an Italian roll! I’ll try the Wagyu burger next time. Public transport: Tram 4, 9, 14, 16, 24, 25 to Muntplein. Perfect place to grab a burger before going to a movie in Tuschinsky or De Munt! Burger Bar is so much better than Burgermeister! Burger Bar burgers are juicy and flavorful, perfectly sized and with amazing fries. Burgermeister burgers *look* pretty (well, foofy is more like it) but they’re drier and less satisfying. Guess they’re trying to be healthy, but you definitely have a point. Good burgers require good fries. Hope they are reading our blog. After reading your recommendation, we checked Burger Bar on a visit to Amsterdam. THE BEST BURGER I have had in Europe. It reminded me of the places I love in Atlanta GA. Thanks for all the great work you do promoting food in Amsterdam. It is nice to see a city with a undeserved reputation for bad food shine. If only Zurich could transcend its “average at best” food scene. Ho Hum. Thanks for the nice words. The Amsterdam food scene is definitely improving. It didn’t exist in the 80s and is making slow but steady progress now. Seems like good restaurants actually attract others to also create good restaurants, so once it starts, it keeps getting better. Glad I helped you to find a proper burger in Europe! I tried both the Kobe and the Angus – Kobe tastes more like you’re eating steak, but the Angus tastes like you’re eating a burger. And the size of it is hefty stuff. I don’t know if it’s organic, but I felt pretty good after eating both burgers. Nice burgers, but rude manager and disgracefully try to charge you 60 cents for a little ketchup to go in the burger when you just spent 30 euros. CHEAP b*stards. Disgraceful. Never going here again.